It seems right now Jurgen Klopp is the hottest thing in Liverpool since the Beatles. Even if he doesn’t turn out to be the saviour of the football club you can’t deny he’s a great character. But, aside from the big energy, the smiley persona and cultivating a fine head of hair, what can he teach us about 5-a-side? After masterminding a 4-1 win for Liverpool against big-hitters Manchester City, Jurgen Klopp gave a glimpse inside his tactical mind and produced two nuggets of advice that apply at any level of football. 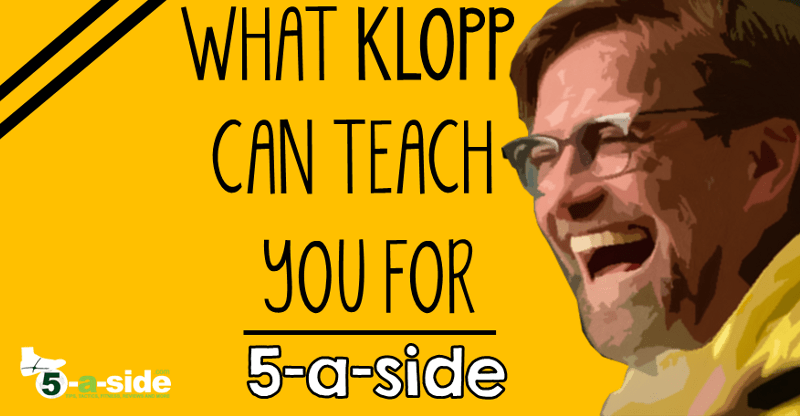 At the time, Klopp’s was offering us more in the way of explanation than education. After all, he was telling us all why he was caught shouting at Emre Can and Roberto Firminho. Shouting, even in a 4-1 win – imagine what it’s like when they’re losing. Right, let’s look at what you’ve got for us Klopp. The first player to suffer Mr Klopp’s wrath was the midfielder, Emre Can. His crime: galavanting forward. Emre is a young lad, he’s full of emotion and everything but when you are tired in a game, then if you cannot make the way back, please don’t make the way forward. Ah, so a box-to-box voyage is ok only as long as that player possesses a return ticket. I’ve lost count of the number of times I’ve waved one of my teammates off on a journey up the pitch, only for them never to be seen in a defensive capacity ever again. A higher proportion of passengers survived the fated voyage of the titanic than end up returning from jaunts forward in your average game of 5-a-side. Klopp generously puts these ill-disciplined wanderings forward down to “emotion and everything”, but that’s generous. The “and everything” should actually translate to: glory-hunting, tactical indiscipline, and pure laziness (at least in the case of most of the examples I’ve seen). So, the message: football played in a successful team entails playing both sides of the game. The attack and the defending; the creating and the destroying. But it’s doing the defending properly that buys you the ticket to be able to go forward each time. 5-a-side players everywhere, before you go gallivanting forward, imagine the steely gaze of Klopp on you, as if to say “you are coming back aren’t you?” Anything other than a certain ‘yes’, should mean you think twice about it. You think: I’ll just have a jaunt forward and see if I can cause some problems. Klopp says: Not so fast sonny. You better be back here by the time we’re defending again. When I tell you why Klopp shouted at a second player, you might be a little surprised. That’s because Firminho, the skillful Brazilian attacking player, was criticised for dropping back too much. We need him as a target and he came very deep. So I said: ‘what are we doing here? We can’t play the ball in that direction when we have no one to play it to, please stay there. Now, you need to understand that Firminho was, due to injuries to more established forwards, supposed to be leading the attack. So it’s a little different to the case of Emre Can. But let’s be clear, there’s not a single player in Klopp’s side who gets the luxury of not having to do any defensive work. Being the furthest player forward just means that you’re the first defender when you don’t have the ball. So what’s his point? Well, Klopp here is talking about what he wants when his team are in possession of the ball. And in that case, he wants somebody to provide an outlet for forward passes. The same point applies in 5-a-side, 6-a-side, Futsal, anything. When you’re attacking there needs to be an attacking option – somebody who is pushing the opposition back, not only to provide a passing option but to leave space for others to play in. When you’re attacking you want to create as much space as you can, and depth is just as important as width, as we’ve previously discussed in our article on Pivot players – the masters of this craft. I mean just look at it, the picture on the left is much better than the one on the right, if you’re the red team and you’re looking to attack. Player ‘X’ might think that by dropping deep he’ll get the ball, but unless somebody else replaces him in attack, all he’s done is just reduce the space the game is being played in. That’s exactly what Klopp was worried about, the game being squeezed into a small space and no forward options being available. When your team is attacking, it’s important to keep somebody pushing up. You think: I’ll just drop back so I can get the ball. Klopp says: No, no, no. If you’re the one who is supposed to be up front providing an option for us then for goodness sake, stay there. Don’t come looking for the ball, we’ll come looking for you. I love Klopp! It’s great that he shares this stuff. I was a big fan of his Dortmund teams. They were well drilled and good value entertainment. If Klopp says track back, who am I to argue! Tell me about it. I’m even thinking about getting a hair transplant to follow in his footsteps. No wait, I’ve gone too far. Let’s just leave it at the football.